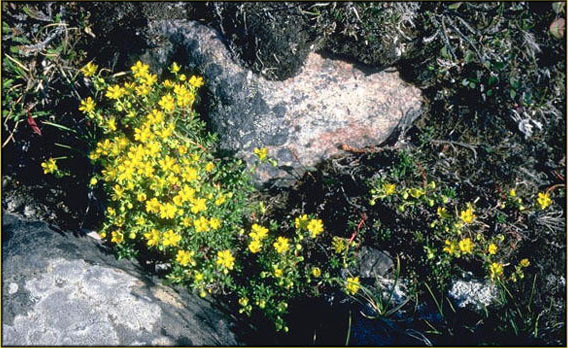 Flora of the Canadian Arctic Archipelago - Saxifraga aizoides L.
French: Saxifrage des montagnes, saxifrage faux-aizoon (Baffin Island), saxifrage jaune (Nunavik). Published in Sp. Pl. 403. 1753. Synonymy. Leptasea aizoides (L.) Haw., Saxifr. Enum. 40. 1821.
, B no. 3: 109. 1948. Vegetative morphology. Plants (1.5–)3–10 cm high; perennial herbs; sometimes vegetatively proliferating by bulbils on stems or leaves (from lateral shoots that become independent). Ground level or underground stems horizontal; rhizomatous (rhizomes rarely collected; the primary root dies after a few years and the plants spread by means of creeping stems that have slender adventitious roots); elongate. Horizontal stems at ground level, branching extensively to shape plant habit as mats. Caudex absent. Aerial stems erect. Leaves present; not heterophyllous; distributed along the stems; erect (or spreading); alternate; persistent, or marcescent (the late-season leaves remain green during the winter; fresh leaves gradually die and persist on the stem a long time). Petioles absent. Leaf blades simple. Leaf blade bases truncate (decurrent). Leaves not grass-like. Blades 3–12 mm long, 1.5–3 mm wide, linear or lanceolate or oblong, flat, veins palmate. Blade adaxial surface glabrous. Blade abaxial surface glabrous. Blades not lobed. Blade margins entire, glabrous or with non-glandular hairs (sparse). Hydathodes present and conspicuous (usually one at the leaf apex on the upper surface, occasionally 2–3 along the leaf margins), or present but inconspicuous. Blade apices obtuse, or acuminate (apiculate). Reproductive morphology. Flowering stems two or more per plant; with leaves. Flowering stems hairy. Flowering stems pubescent. Flowering stem hairs simple; shorter than the diameter of the flowering stem; white or translucent, or yellow; glandular hairs present. Flowers solitary (usually in the Arctic Archipelago), or in inflorescences. Inflorescences cymose (if applicable); 0–1 cm long. Pedicels with glandular hairs. Flowers per inflorescence 1–4 (rarely 3 or 4); medium-sized. Sepals conventional; 5; free; 1.5–2 mm long; 2.5–4 mm wide; green (there are glandular hairs on the receptacle but not on the petals). Calyx glabrous. 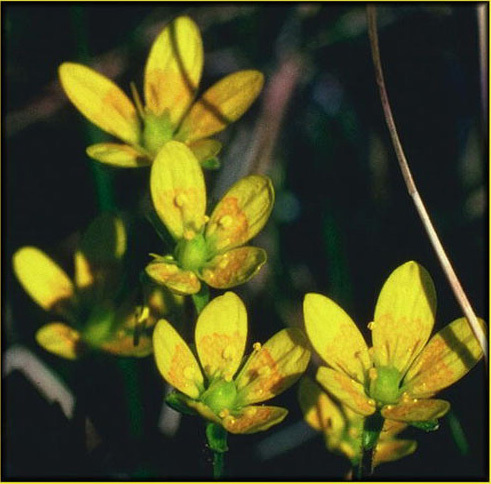 Petals conventional; free; longer than the calyx, or same length as the calyx; 5; yellow; with contrasting markings (living plants), or without contrasting markings (that fade in herbarium specimens); obovate; unlobed; (3.5–)4–6 mm long; 2.5–3 mm wide. Stamens 10. Anthers yellow; short-cylindrical. Nectaries present. Receptacle 2–3.5 mm high. Ovary superior; carpels 2 (rarely 3); partly fused. Ovaries glabrous. Placentation axile. Ovules per ovary 50–100 (approx.). Fruit with calyx persisting; dry; a capsule (comprising 2 or 3 partly fused flattened ovoid carpels with divergent styles); brown; 2.5–3.5 mm long; 5.5–6 mm wide; dehiscent; splitting to the base into separate segments. Seeds 50–100 (approximately); brown; surfaces hairy (at 10×, minutely tuberculate seen at 40×). Chromosome information. 2n = 26. (2n) (2x) = 26. Skovsted (1934); Böcher (1938a, 1941, Greenland); Arwidsson (1943, northern Europe); Löve and Löve (1951, 1956, Iceland; 1982a, Arctic Canada); Jørgensen et al. (1958, Greenland); Sokolovskaya (1958); Sokolovskaya and Strelkova (1960); Packer (1964, northwestern Canada); Laane (1965, Norway); Knaben and Engelskjøn (1967, Norway); Mulligan et al. (1972, western Canada); Mulligan and Cody (1973); Engelskjøn (1979, northern Norway). A few more southern counts. Taxon as an environmental indicator. Polunin (1940) considered species to be a sure sign of the presence of calcium carbonate in appreciable quantity, at least in the Arctic. He reported the northernmost record as Spitsbergen, 79°55'N. It has since been collected in Canada on Ellesmere Island at Borup Fiord, 80°49'N (Canada). Ecology and habitat. Substrates: imperfectly drained moist areas (often along streams); calcareous. Insect pollination appears to be the rule (Warming 1909). 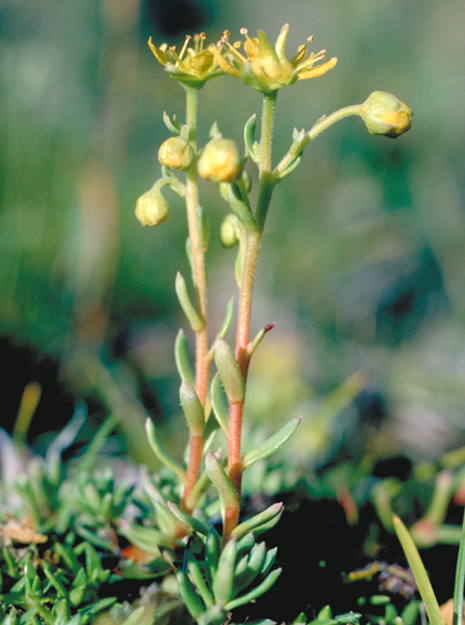 This author reported that in Greenland the flowers of this species are distinctly protandrous. At first the stamens are widely outspread, but afterwards they bend inwards in succession. All the stamens are again widely outspread and have more or less emptied their pollen when the styles spread out and the stigmas open. There is a short time when the anthers and stigmas are both functional. The nectary consists of a massive, ring-shaped swelling around the base of the styles, and on the finely pitted surface, numerous drops of nectar may be seen. In Canada, flowering is plentiful and seed always ripens (Polunin 1940). North American distribution. Alaska, Yukon, Northwest Territories Islands, continental Northwest Territories, Nunavut Islands, continental Nunavut, northern Quebec, Labrador. Range in the Canadian Arctic Archipelago widespread (The species has been more widely mapped in the Arctic Archipelago since Porsild (1964), but it is relatively uncommon.). Uncommon. Arctic, alpine. Arctic islands: Baffin, Ellesmere, Banks, Victoria, Southampton (Coats, Digges, Resolution, Melville Peninsula). Northern hemisphere distribution. Amphi-Atlantic (throughout much of Europe), or North American. Northern Fennoscandian, Svalbard  Franz Joseph Land, Polar Ural  Novaya Zemlya, North Alaska  Yukon, Central Canada, Labrador  Hudson Bay, Ellesmere Land  Peary Land, West Greenland, East Greenland. General notes. Polunin (1940, p. 262) commented that "unlike most other members of the genus, and in spite of the fact that Engler and Irmscher (1919, p. 466) introduced it as 'Typus polymorphus S. aizoides', this species does not appear to vary much in our area, where it grows generally as a loose mat or tuft about 6 (4–10) cm high. It seems to be as strongly calciphilous as any species; having now for several years past made a point of testing the soil around the roots of specimens met in ordinarily acidic country in the north, and [always found] at least some scraps that would effervesce strongly with HCl". Elven et al. 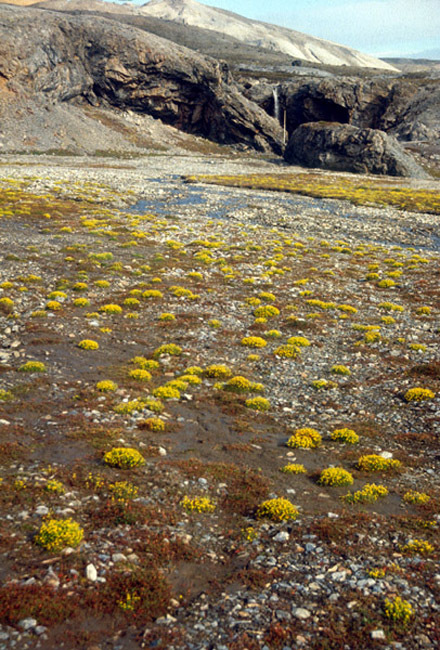 (2003) noted that "the arctic plants in Svalbard, Greenland, and northern Canada differ from the European ones (which reach the arctic in northern Norway)in, e.g., growth form, leaf shape, inflorescence shape, petal size and shape, and petal colour. Some racial differentiation might be involved." That is the reason for Engler and Irmscher's "typus polymorphus"; the European plants they mostly studied are very polymorphic, but mainly in one character. There are three main flower colour morphs, with a few intermediates: yellow, orange with red dots, and reddish purple. 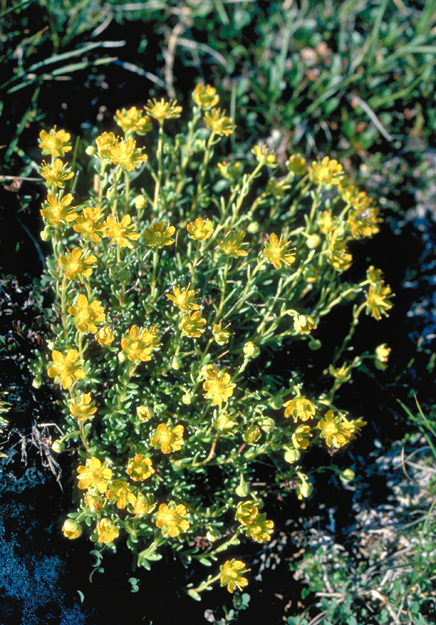 Elven (personal communication, 2005) remarked that all the High Arctic plants he has seen are yellow-flowered and also differ from the yellow-flowered European mainland ones in some other, small features. Illustrations. • Habitat. 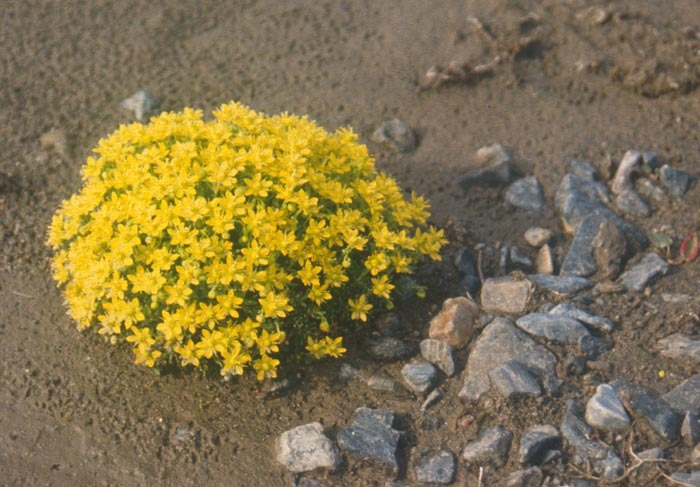 Plants with yellowish heads growing near the marker beside a small runoff stream. Nunavut, Baffin Island, Ogac Lake. 11 July, 2004. Aiken and LeBlanc 04–058. CAN 586527. 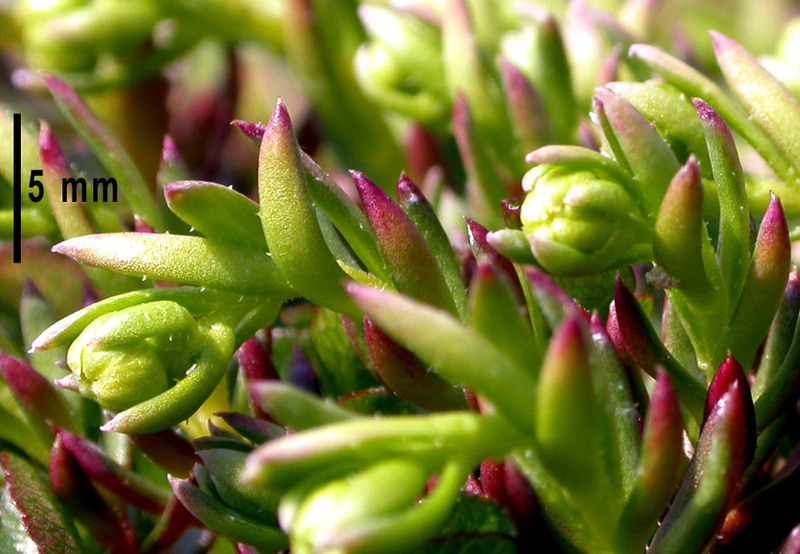 • Close-up of plants in bud. 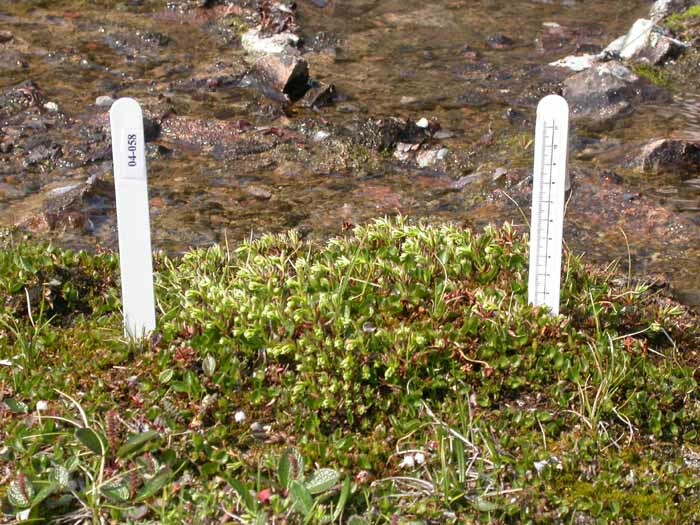 Plants with whitish yellow heads growing between the markers beside a small runoff stream. Nunavut, Baffin Island, Ogac Lake. 11 July, 2004. Aiken and LeBlanc 04–058. CAN 586527. • Habitat. 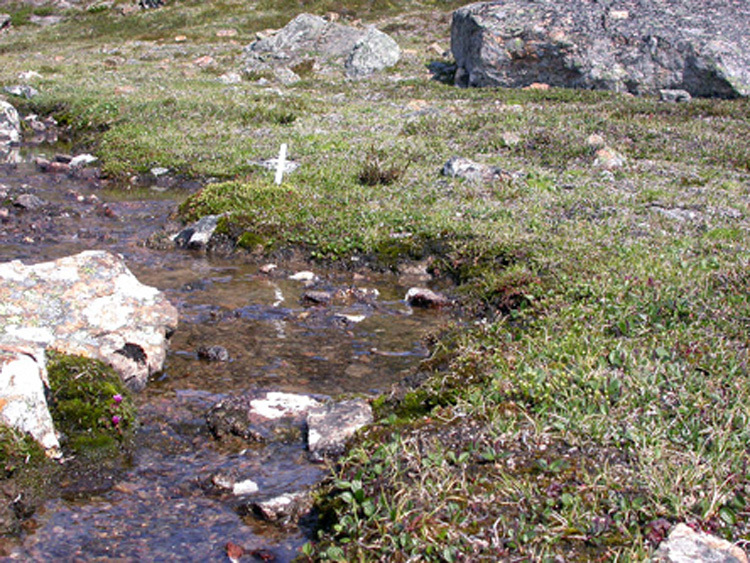 Plants growing in moss beside a small stream on a densely vegetated slope. Nunavut, Baffin Island, Iqaluit, on trail to Apex. L.J. Gillespie 6259. CAN. • Close-up of leaves. Leaves that appear to be glabrous to the naked eye have sparse, very tiny trichomes on the margins. Note two young flower buds. Aiken and LeBlanc 04–058. CAN 586527. • Habitat. Large stand on river fan in limestone area. Norway, Svalbard, Blomstrand. July, 1995. Photograph by R. Elven. • Close-up of plant. Semi-globular shape of tussock on river fan in limestone landscape. Norway, Svalbard, Blomstrand. July, 1995. Photograph by R. Elven. • Habit. Close-up of a tufted plant growing in moss beside a small stream on a densely vegetated slope. Nunavut, Baffin Island, Iqaluit, on trail to Apex. L.J. Gillespie 6259. CAN. • Habit. Close-up of plant showing simple leaves on the flowering stems that have 3–4 flowers. Right terminal flower has two large carpels joined at the base. L.J. Gillespie 6259. CAN. • Close-up of flowers. Flowers with conspicuous orange markings at the base of the 5 petals and 10 anthers that are in two rows. In the lowest flower, the outer anthers have shed pollen, the inner whorl of anthers have not yet opened. Two carpels fused almost completely can be seen in the uppermost flower. L.J. Gillespie 6259. CAN. • Line drawing of flower. 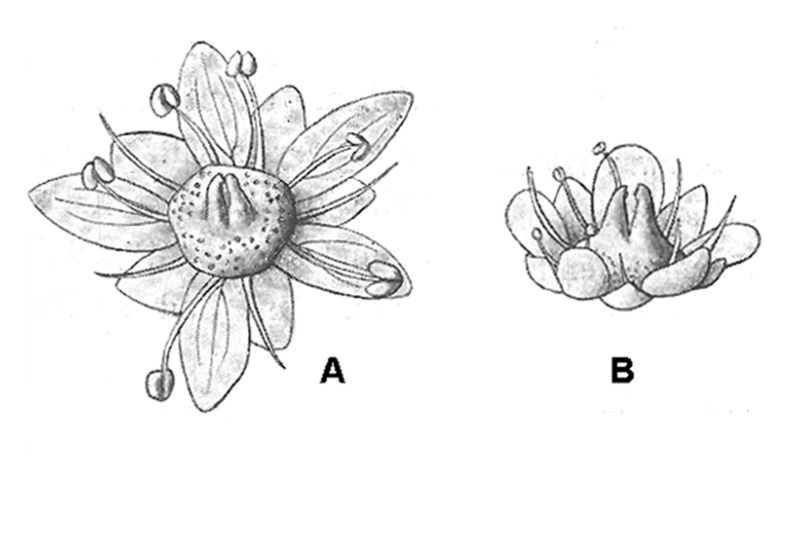 Flowers have 5 sepals, 5 petals, 10 anthers, and two carpels that are fused at the swollen base. Warming 1909. p. 175. • Arctic Island Distribution.